Expressed from the fruit of a palm tree, palm oil, like most other oils, contains about 120 calories and 13.6 grams of fat per tablespoon. The breakdown of saturated and unsaturated fats plays an important role in the comparison of palm oil to other vegetable oils. Palm oil supplies vitamin E, as well, which is another benefit to consider. Of the 13.6 grams of fat in a tablespoon of palm oil, 6.7 grams are saturated. The American Heart Association recommends that you limit the amount of saturated fat you eat to less than 7 percent of your total caloric intake. Doing so can help protect the health of your heart and keep your cholesterol levels low. Palm oil is higher in saturated fat than other types of vegetable oil. For comparison, a tablespoon of canola oil only has 1 gram of saturated fat. The same amount of olive oil has 1.9 grams of saturated fat. Palm oil is better than coconut oil, however, which contains 11.8 grams of saturated fat per tablespoon. While lowering the amount of saturated fat in your diet is a good way to reduce the risk of heart disease, increasing your intake of unsaturated fats can help protect the health of your heart, too. Both polyunsaturated and monounsaturated fats help reduce cholesterol levels, according to the American Heart Association. A tablespoon of palm oil contains 5 grams of monounsaturated fat and about 1.3 grams of polyunsaturated fat. Both canola and olive oil, for comparison, contain more unsaturated fats than palm oil, while coconut oil contains hardly any unsaturated fat. With 2.17 milligrams of vitamin E per tablespoon, palm oil is a good source of this essential nutrient. That amount is 14 percent of the 15 milligrams you need to include in your daily diet, according to the University of Maryland Medical Center. Vitamin E is an antioxidant that provides protection to your cells and that can reduce your risk of certain health problems such as heart disease and cancer. While canola oil has slightly more vitamin E per tablespoon, olive and coconut oil contain less vitamin E per serving. If you're concerned about your saturated fat intake or if you have high cholesterol, palm oil might not be the best choice for you. Palm oil, however, doesn't contain trans fats, which, like saturated fat, can raise your bad cholesterol level, and that's a plus. 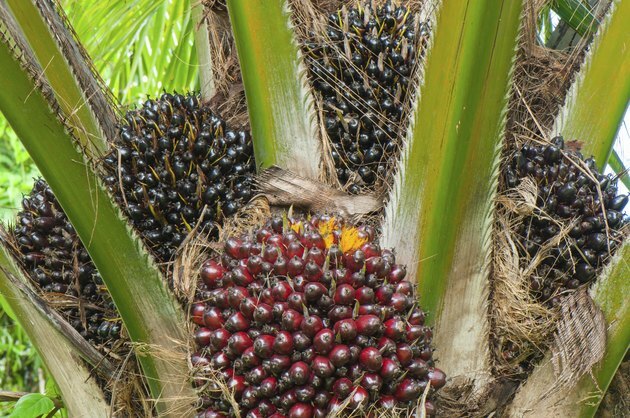 Palm oil also contains antioxidants, such as carotenoids and tocotrienols, that might provide protection against certain types of cancer, according to a 2007 article published in the "European Journal of Lipid Science and Technology."